Click on "Student Sign-In" then select "Ratio Monitoring." Click on the blue "Create Alert" button (see screenshot above). You'll see a form pop-up with fields to help you customize your alert. Let's break down the form. The first field, Set Student:Staff Ratio, asks what number of students per staff you would like to set the alert to. Based on this number, staff will be alerted when a room exceeds its ratio, either by having too many students per staff, or too many staff per students. 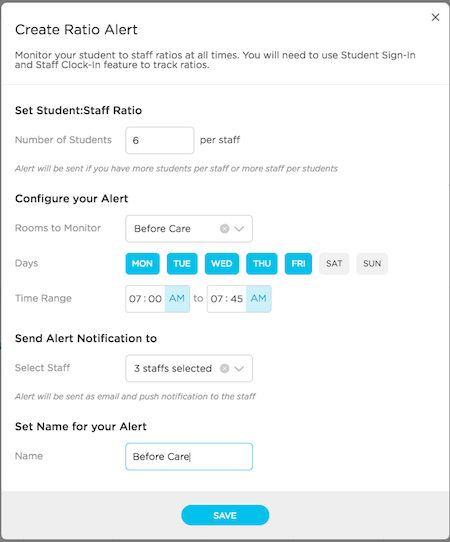 For example, if you set your ratio for 6 students per each staff member, you will receive an alert if you have 7 students in a single room with only one staff member. You will also receive an alert if you have 2 staff members in the room with only 6 students. The second field, Configure your Alert, asks you to choose which room you would like to monitor, which days of the week, and what time range. Each alert can only monitor a single room, so you will need to create a different alert for each room. If you opt to have different alerts based on different times of day (before care vs after care, for example), you will also need to create separate alerts for those two time frames. The third field, Send Alert Notification to, is where you choose which staff members should receive an alert when the ratios for these settings are exceeded. Click on the drop-down menu to select as many staff members as necessary for the alert. Note: These staff members will receive a push notification regarding the alert if they are logged into the app. The fourth field, Set Name for your Alert, is where you create a name to distinguish this alert from any others that you have or would like to create. 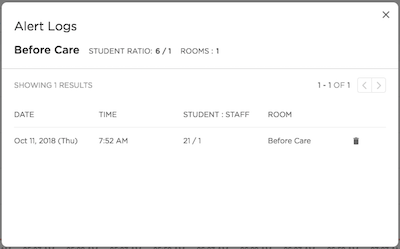 Once the ratio alerts are in place, you will see a red number indicating any alerts that have been triggered by the student to staff ratio being off in one of your rooms (see below). Click on the red icon or the small square icon to view your Alert Logs, which show the date, time, room, and number of students vs staff who were signed in when the ratio alert was triggered. You can also click on the vertical ellipsis (...) at the end of the row to pause, edit, or delete an alert.